Burne-Jones is the leading figure associated with the second generation of Pre-Raphaelites. He was born in Birmingham, the son of a picture-frame maker, and educated at Exeter College, Oxford where William Morris was a fellow student. In 1856 he was introduced to Dante Gabriel Rossetti, whose magnetic personality led Burne- Jones to abandon his divinity studies and become a painter. 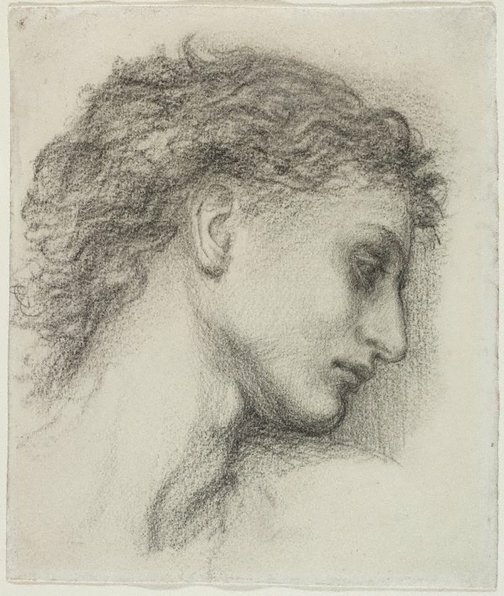 Aside from some informal drawing lessons given by Rossetti, Burne-Jones was essentially self-taught. His early works – finicky, intense and quaintly medievalising pen and ink drawings – are plainly the work of a draughtsman untainted by Royal Academy training. His instinctive feeling for two-dimensional design is also evident in the stained-glass window cartoons he produced from 1861 for the firm of Morris, Marshall, Faulkner & Co.
During the 1860s Burne-Jones’s style became softer and more idealised, stimulated by several artistic pilgrimages to Italy from 1859 onwards. His second trip in 1862 was funded by John Ruskin, who accompanied Burne-Jones and his wife to northern Italy. Ruskin introduced his protégé to 16th-century Venetian painting and commissioned him to make copies, the influence of which is apparent in the treatment of the landscape in the Gallery’s Saint George canvas. This painting is one of the series originally commissioned by the successful watercolourist Myles Birket Foster for his newly built house, The Hill, at Witley in Surrey. Burne-Jones was asked to provide seven canvases illustrating the legend of Saint George, which would be installed as a frieze around the dining room. Three of the pictures were completed in 1864 and the remaining four in 1867. Foster was forced to sell The Hill in 1893 and the following year the series was sold at auction in London. At least 15 chalk studies, all in the Birmingham Museum and Art Gallery, are known for the Gallery’s painting alone. They reveal the considerable modifications that Burne- Jones made to the composition. To these we can add the preparatory head study of Saint George also in the Gallery’s collection, the soft, smudged features of which reveal Burne-Jones’s attempt to assimilate the flavour of Italian High Renaissance drawings. The sensuous, impassive head is a hallmark of the artist’s style, for even in lancing the dragon, this bloodless Saint George does not bat an eyelid. ‘The moment you give what people call expression’, Burne-Jones wrote, ‘you destroy the typical character of heads and degrade them into portraits, which stand for nothing’. Prints & drawings Europe 1500-1900 , Sydney, 2014, p 148, col illus p 149.